Disaffected by their synagogues’ emphasis on self-preservation and obsession with intermarriage, most Jews looking for an intelligent inquiry into the nature of spirituality have turned elsewhere, or nowhere. Meanwhile, faced with the chaos of modern life, returnees run back to Judaism with a blind and desperate faith and are quickly absorbed by outreach organizations that—in return for money—offer compelling evidence that God exists, that the Jews are, indeed, the Lord’s “chosen people,” and that those who adhere to this righteous path will never have to ask themselves another difficult question again. Ironically, the texts and practices making up Judaism were designed to avoid just such a scenario. Jewish tradition stresses transparency, open-ended inquiry, assimilation of the foreign, and a commitment to conscious living. Judaism invites inquiry and change. It is an “open source” tradition—one born out of revolution, committed to evolution, and willing to undergo renaissance at a moment’s notice. But, unfortunately, some of the very institutions created to protect the religion and its people are now suffocating them. If the Jewish tradition is actually one of participation in the greater culture, a willingness to wrestle with sacred beliefs, and a refusal to submit blindly to icons that just don’t make sense to us, then the “lapsed” Jews may truly be our most promising members. Why won’t they engage with the synagogue, and how can they be made to feel more welcome? 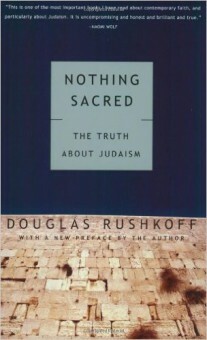 Nothing Sacred is a bold and brilliant book, attempting to do nothing less than tear down our often false preconceptions about Judaism and build in their place a religion made relevant for the future.